Professor Panicos Kyriacou and Dr Michelle Hickey share Excellence Award. 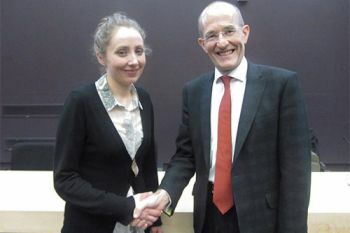 Professor Panicos Kyriacou and Dr Michelle Hickey have won the 2013 Excellence Award (£50,000) as joint winners of the 6th annual University Research Competition (URC), held on Wednesday 16 January. The pair, from the Biomedical Engineering Research Group (BERG) in the School of Engineering and Mathematical Sciences (SEMS), submitted a proposal entitled: "Personal Lithium Blood Level Analyser for Bipolar Disorder Patients". "As far as monitoring mental disorders go, this project challenges the status quo. Before now, there have been no non-invasive medical devices to monitor or assess pathologies such as bipolar disorder. Patients with Bipolar Disorder are completely dependent on a toxic drug called lithium that maintains their mental equilibrium. Too much of the drug causes toxicity and too little of it causes patients to have uncontrollable mood swings. The funds we have been awarded will be utilised in the development of a prototype non-invasive wearable sensor, capable of indicating and differentiating between different levels of lithium concentration in the blood - and giving a warning to patients." "There is currently a severe lack of assistive medical technology for Bipolar Disorder patients. These funds will allow us to push forward this exciting work: the development of a blood lithium sensor. Such a device would provide more information on blood levels of lithium to psychiatrists, clinicians and the patients, allowing for a more effective management of Bipolar Disorder with lithium therapy." Lecturer in Mathematics, Dr Maud De Visscher (SEMS), received a commendation, and Lecturer in Optometry and Visual Science, Dr Steve Gruppetta (School of Health Sciences), won a bottle of Champagne for Best Presentation. Celebrating the diversity of research carried out at City, the annual University Research Competition sees academics across the University presenting research proposals to an audience of over 70 colleagues, covering a wide range of topics. Judges at this year's competition comprised a distinguished panel of experts: Chris Daykin, former Government actuary; Professor Liz Miller of the Health Protection Agency; Professor David Rhind, former Vice-Chancellor of City ; Dr Michael Shears, Ove Arup & Partners; and Marcelle d'Argy Smith. Professor Jo Wood (2012 URC winner) of the giCentre in the School of Informatics, provided an update on his project, 'How does a city move?'. University Staff Research Prizes were also awarded. The University Staff Research scheme seeks to recognise and reward the exceptional research-related achievement of a member of staff or a team of staff in support of City's Vision. Vice-Chancellor, Professor Paul Curran, awarded prizes to: Dr David Collins, Senior Lecturer at the City Law School; Dr Stephanie Feiereisen, Senior Lecturer, The Sir John Cass Business School; Anna Faelten, Deputy Director, Mergers & Acquisitions Centre, Cass Business School; Dr Emmanuel Pothos, Senior Lecturer in Psychology, School of Arts & Social Sciences; Dr Anh Tran, Lecturer, Cass Business School; and Dr Daniel Wilsher, Senior Lecturer, The City Law School.